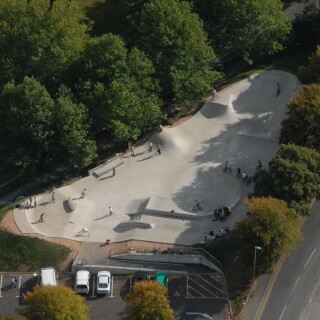 Dorchester skatepark was built by Maverick Industries and opened in 2009. It is an all concrete transitions bowl park with a plaza style street section at the bottom. It holds something for everyone of all ability hosting a decent set of obstacles. 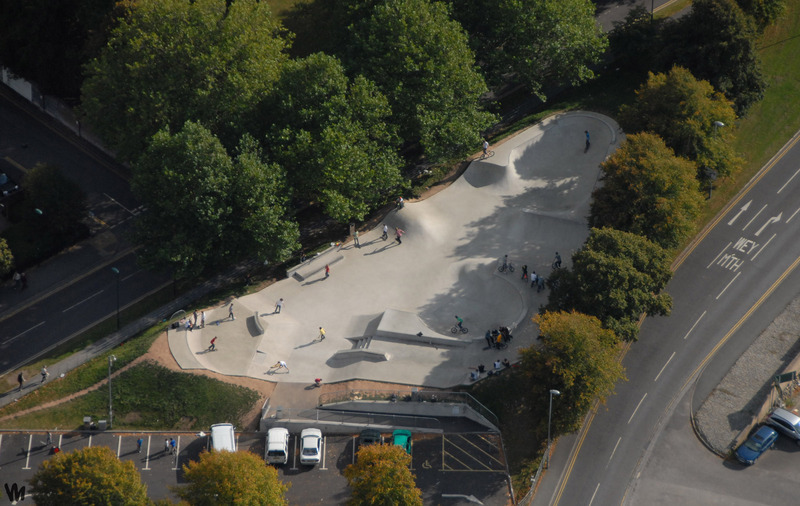 At the top of the bowl section of the park there is a large, deep bowl with an open side that has a tight corner with a tall extension. The side opens up into a large flat area with a big roll over adjacent to a mini ramp that spines with the large bowl. Next to the mini ramp is a pump bump that joins it to a rounded, whippy speed bowl with a long extension wrapped around the edge. The end of the bowl section leads nicely into the beginning of the plaze section and on one side is a manny pad with ledge adjacent to a wall ride, stair set with hubba and flat bank combo. These face onto a hipped flat bank with a ledge at the top and a euro gap and a curved quarter piep finishing off on the top platform. This is a great local park and has aspects that will appeal to every type of rider whether you like to ride street or transitions. There are endless lines here that you can pump your way around without having to push and the arrangement is creative meaning that you could easily spend a day here and not hit every line. Dorchester South train station: Exit Dorchester South station onto Weymouth Avenue and Dorchester skatepark will be in sight. Dorchester West train station: Exit Dorchester West station onto Mambury Road and head south until Dorchester skatepark is in sight. Queens Avenue bus stop: Exit the bus onto Weymouth Avenue and head north until Dorchester skatepark is in sight. There are no on site toilets but there are free to use facilities nearby in the shops.